Just 31 days until Christmas! While some people may want to celebrate Thanksgiving before they think about Christmas, if you are going to make something (or lots of somethings!) for Christmas you need to start now (or last month!). 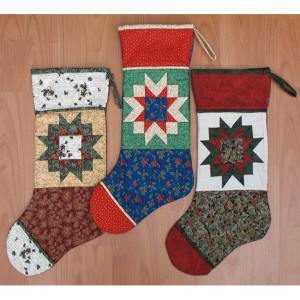 Our Christmas quilt kits will give you a running start. With the pattern AND the fabric you’ll be ready to start right away. 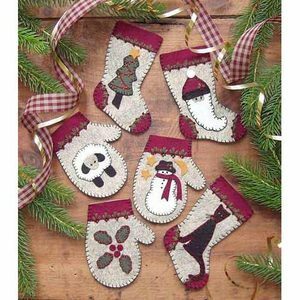 Warm woolen mittens and adorable stockings work well as ornaments, as present decorations, or as mini-gift holders. 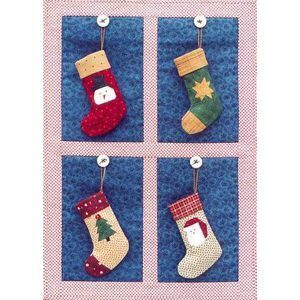 The Christmas Woolens Complete Kit includes wool felt, embroidery floss and gold string, plus patterns and instrucions. Easy to make, fun to use, even more fun to give. 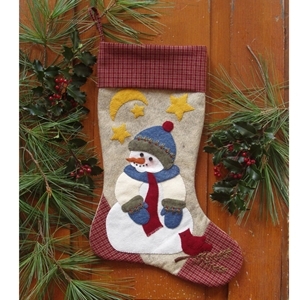 Santa and Rudolph will make a great addition to your entryway, welcoming holiday visitors. The Santa Complete Kit includes EVERYTHING . . . fabric (for the top, back, and binding), batting, buttons, bell, and complete instructions. All you supply is the thread and the “work”. Finished wallhanging is 13″ x 15″. 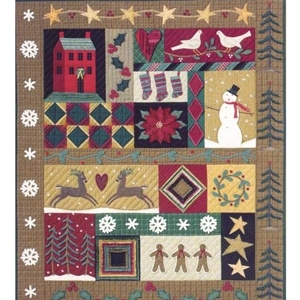 Celebrate The Season is a sampler style quilt that measures 54.5″ x 46.5″. Piecing, applique, and paper piecing are all part of the process. The kit includes all the patterns and all the fabric for the quilt top and for the binding. 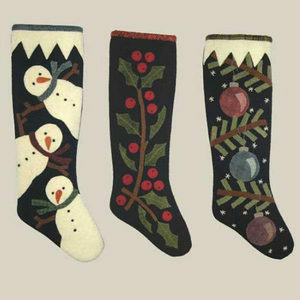 It’s wintry enough that you can leave it up all season, not just for Christmas. 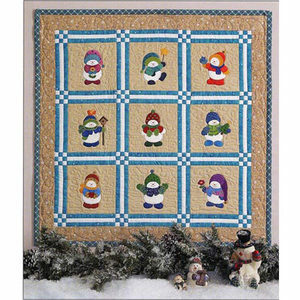 Skating Party is another Christmas-y quilt that is suitable for the entire winter season. Starting with a panel from the “Snow Day” fabric line in a blue/sage green/cream color scheme, it will go together quickly. Simple blocks set on point finish the look. The kit includes pattern and all the fabric needed for the top and binding. 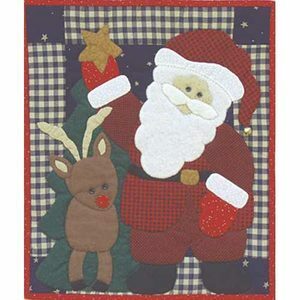 Browse the rest of the Christmas Quilt Kits. 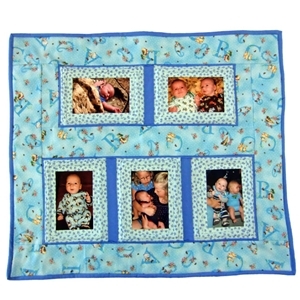 The kits themselves make great gifts, especially for new quilters. Or enjoy the construction yourself, and you can gift the finished project . . . if you can part with it! Most of us haven’t yet seen our first snowfall of the season, but we all know it’s coming eventually. Snow on the roads usually isn’t a welcome sight, but seeing a snowman will usually bring a smile. 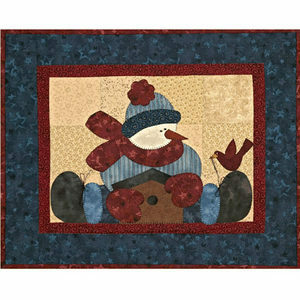 What better focus for a winter quilt than a cheery snowman? 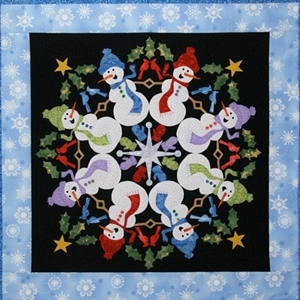 Here’s a sampling . . . .
Snowmen Forever offers two options: one is colored with crayons and stitched, the other is appliqued. 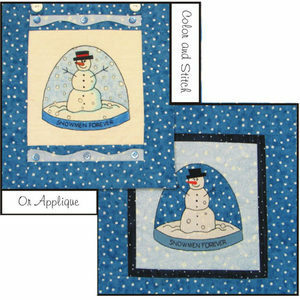 The snowmen are then placed in a snowglobe so they won’t melt! Use as a wallhanging, a pillow, or anything else you choose. Eight Silly Snowmen dance around in a circle holding, um, sticks. 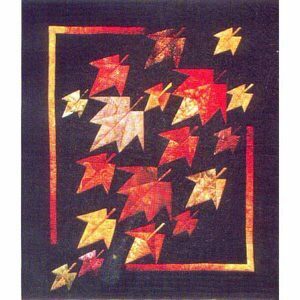 Toss in some holly leaves, stars, mittens, and birds that all combine to make a fun, busy snowflake. Also available as a quilt kit – comes with the pattern and all the fabric (everything but the batting). No need to hunt up the perfect fabric; just start sewing! Here’s a few more Silly Snowmen. Their winter adventures will make you chuckle, and have you wondering how they will manage to survive until Spring. Straddling Snowboy hugs a birdhouse as he watches the bird play with his shoelace. Tiny buttons for eyes and floss for the laces add some three dimensional interest to this wallhanging. Have fun digging through your scraps to find different outfits for each of these Frosty Babies. Each on is holding a different prop – just for fun! This is just a sampling of the patterns available. 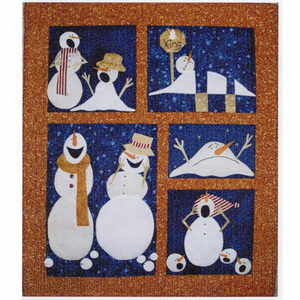 Browse all the rest of the Snowman patterns and all the rest of the Snowmen patterns. Enjoy! >We might not be having fall weather yet, but it is September so we all know that it’s coming. The summer adventures are behind us and we’re looking ahead to fall activities and holidays. 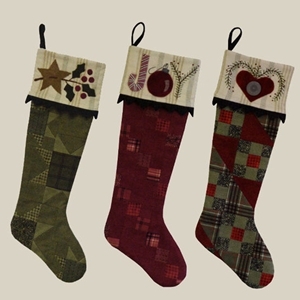 During the ‘in-between’ you have time to make a wall hanging to dress your home for the season. Here are just a few suggestions . . . . This scarecrow looks like he is thinking about job security! If the farmer sees all the birds hanging around he just might be getting his pink slip, so he’s hollering Shoo!, apparently to no avail. Nothing says fall like apples and apple picking. 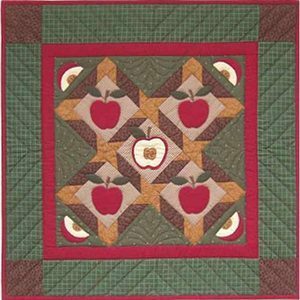 This Apple wall hanging measures 22″ square. 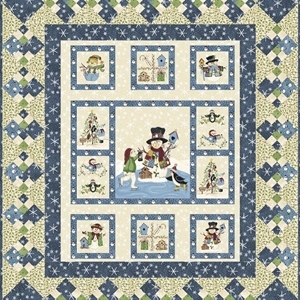 A combination of patchwork and applique, this quilt pattern is also available with fabric: Apple Complete Kit. Soon we’ll be treated to the annual Autumn Cascade of colorful leaves. We love to see the colors on the trees, and watch the colorful leaves floating to the ground. Raking them, well that’s another matter altogether! Enjoy them on your wall – no raking required! 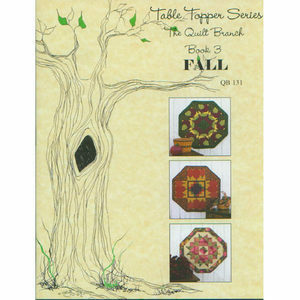 Book 3 in the Table Topper Series is Fall. 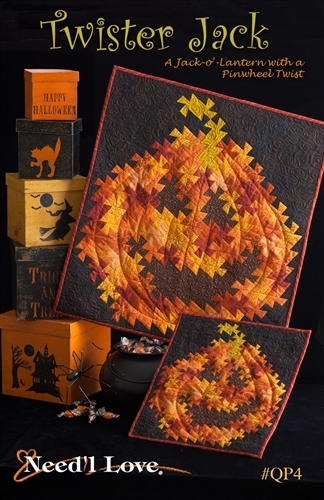 Susan and Mary Jane of The Quilt Branch provide instructions for three fall themed table toppers. 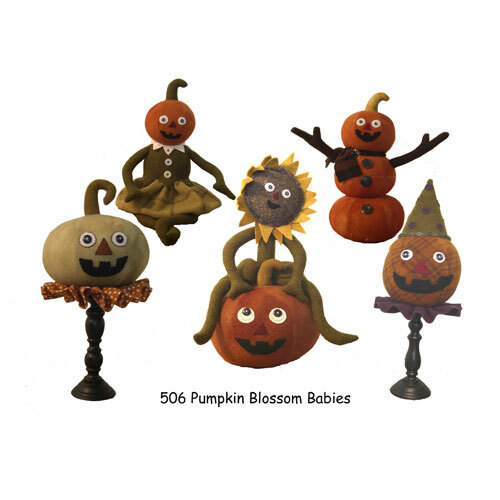 You can make one for each fall month. 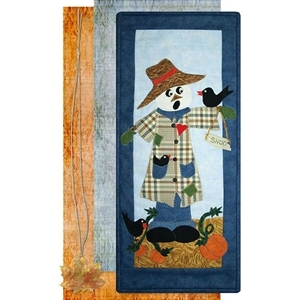 This Fall Sampler wallhanging pattern also includes instructions for a scarecrow table runner pattern. Two patterns in one! 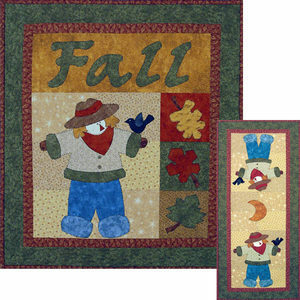 Visit the Fall Quilt Patterns section of our website to see lots more patterns. 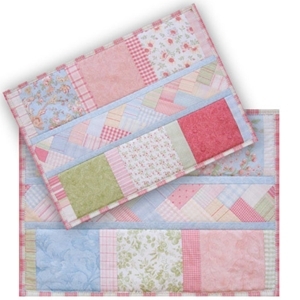 Have you ever used a Quilt Kit? While it’s more creative to make your own fabric choices, or even to design your own quilt, quilt kits certainly have their place. They provide a jump start to a project. You know how (beautiful) it’s going to look when you are finished. And they speed up the process. Well, sometimes. And sometimes they are long projects themselves. 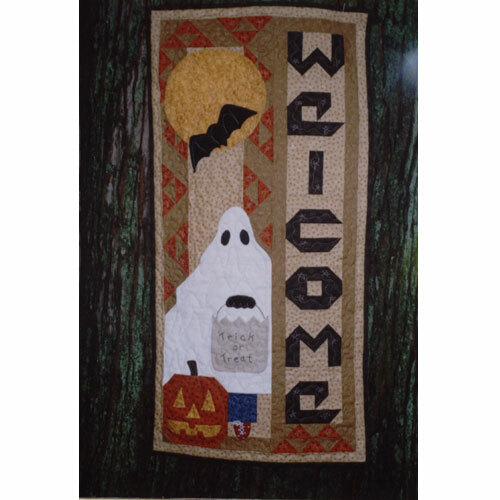 We have dozens of kits available, from the quick and easy to the more intricate, months-long quilts. You’ll be Sittin’ Pretty at mealtime with these lovely placemats by Black Cat Creations. 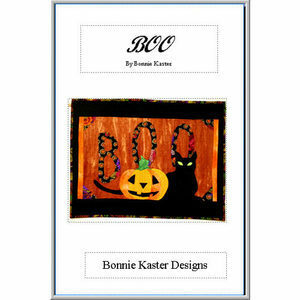 The kit includes the pattern and all the fabric needed to make six placemats, including the backing. The only other thing you’ll need is the backing. This patterns works well with charm packs so you’ll probably make more than one set! Flannel Pals Baby Quilts are unique in that not only are all the fabrics included, but they have also been cut already! 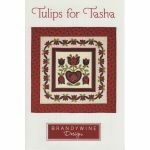 You’ll get the pattern (quick and easy), all the quilt block pieces, the border, the binding, and color coordinated backing. An easy way to make a from the heart and hands baby shower gift. Also available in pink colorway. Here’s another kit that is great for gift giving. This Photo Collage Quilt Kit is available in several colorways, making it appropriate for baby showers, graduations, anniversaries, and weddings. Kit includes the instructions, all the fabric, and the batting. Just add thread! If you have a little more time to invest, Stars In Granny’s Garden has a big beautiful payoff. 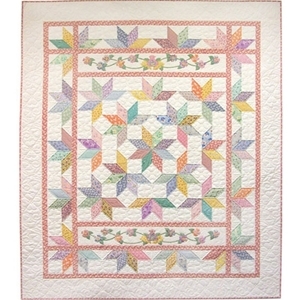 This Lemoyne Star quilt is easy to piece. It has a scrappy look, but you don’t have to do any digging in your scrap pile! 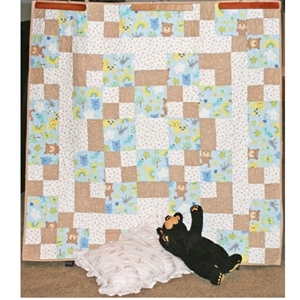 Check out the rest of the quilt kits – you’ll be sure to find a few that you like.